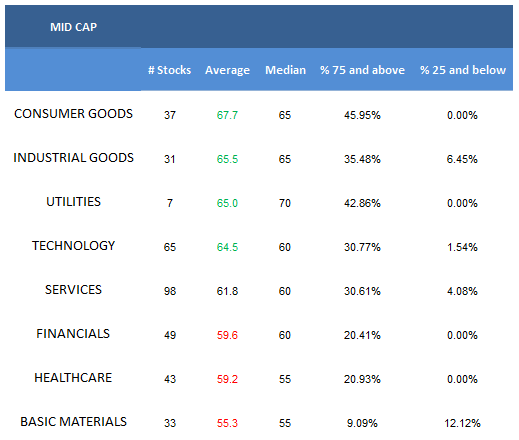 The best mid cap sectors is consumer goods. The highest scoring mid cap industry semi equipment & materials. The average mid cap score is 62.14, which is below the four week moving average score of 63.21. The average mid cap stock in our universe is trading -25.35% below the 52 week high, -0.99% below its 200 dma, has 6.24 days to cover held short, and is expected to grow EPS by 16.16% in the coming year. 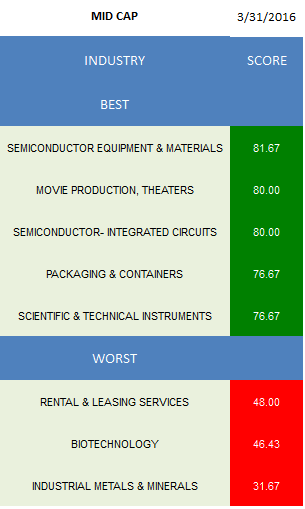 Consumer goods, industrial goods, utilities, and technology score above average. Services score in line. Financials, healthcare, and basics score below average. Scores will shift to reflect second quarter seasonality next week. 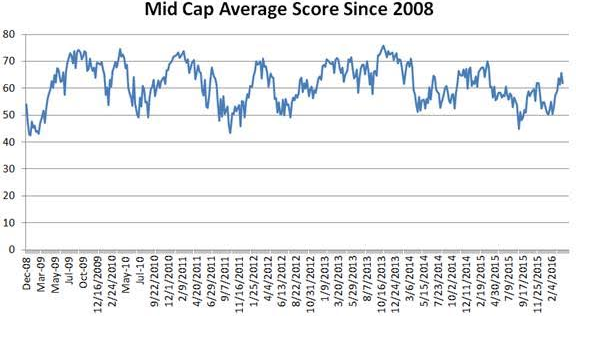 The following chart shows historical mid cap scores since the Great Recession. The strongest mid cap industry is semi equipment & materials (TER, SPIL). 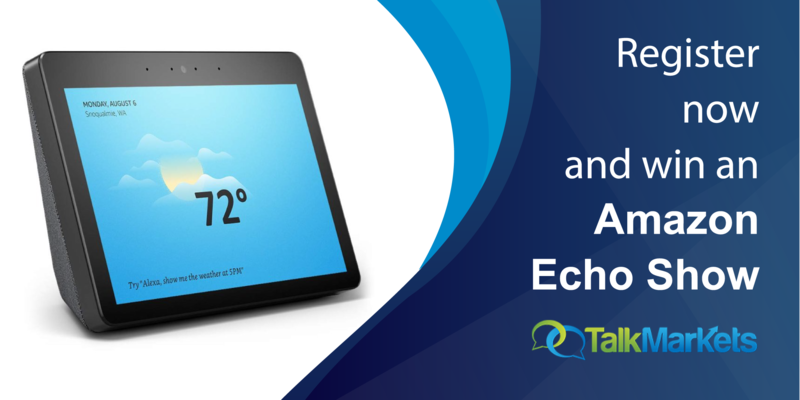 Movies (RGC, DWA), semi ICs (MSCC), packaging & containers (TUP, MINI, BMS), and scientific & technical instruments (COHR, BRKR, FLIR, CGNX) are also top scoring. Oil & gas equipment & services (RES, PDS) is the only above average scoring basics basket. Every consumer basket scores at or above average, led by packaging & containers, processed & packaged goods (GIS), and textiles (COLM, CRI). REITs (REG, NNN, AIV, WRI, KRC, CLI) and surety & title insurance (MBI) are strongest in financials. Scientific & technical instruments, healthcare plans (WCG, CNC, MOH), and medical instruments (TFX, WST, HAE, PKI) can be bought in healthcare. industrial electrical (LFUS, RBC), residential construction (NVR), and diversified machinery (BGG, ATU, NDSN) best in industrials. Movies, restaurants (WEN, CBRL, CAKE, TXRH), and trucking (ODFL, KNX) can are best in services. The best technology groups are semi equipment, semi ICs, and business software (WBMD, CTSH).Gas utilities (NJR) can also be owned.